After noticing one image, I found myself immersed in Mt. Hood’s use in advertising, signs and as decoration. Always a pretty picture, Mt. Hood adds serenity to visuals. It’s a reminder of our nearby nature. I do wonder if artistic interpretations are necessary when spectacular views are available from certain vantage points around town. Artists do need to get their Mt. Hood portraits right. It’s about including the pointy top and the secondary little groove. Snow coverage is another element each artist must consider when creating these images. It has different looks all year but for much of the time it remains a winter wonderland. Regardless, the mountain’s beauty is an effective tool for drawing people into various messages and mediums. 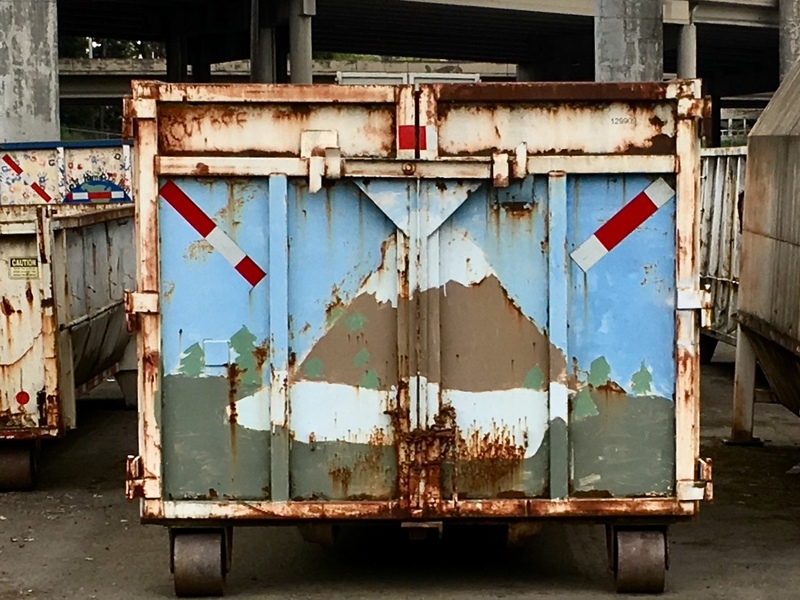 This dumpster, with its Mt. Hood decoration, inspired this post. I spotted this recreation of Mt. Hood in a lot with other dumpsters decorated by elementary school students near the underpasses that surround the Fremont Bridge. Images of Mt. Hood began to appear everywhere. 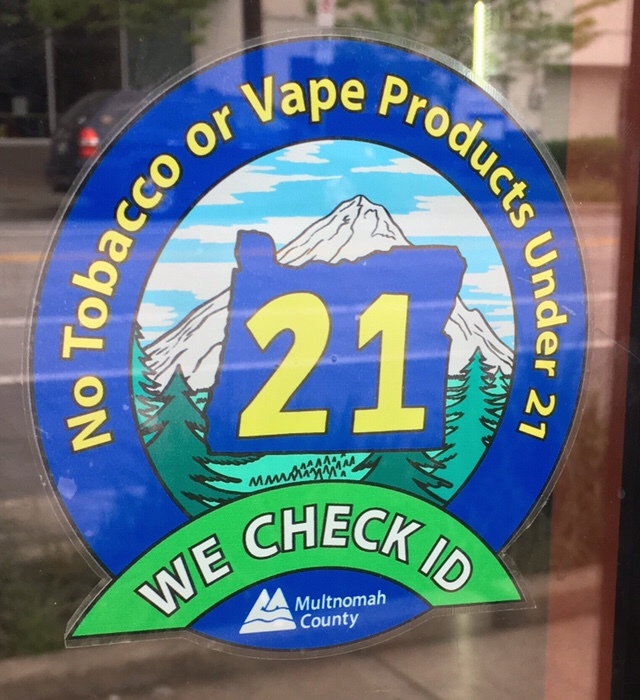 Perhaps there’s a subliminal message about volcano smoke in this image concerning smoking products and ID checks, otherwise there’s no connection that I can make. Mt. Hood livens up a dull message offering pretty scenery that has me wondering if Mt. Hood is even a Multnomah County resident. 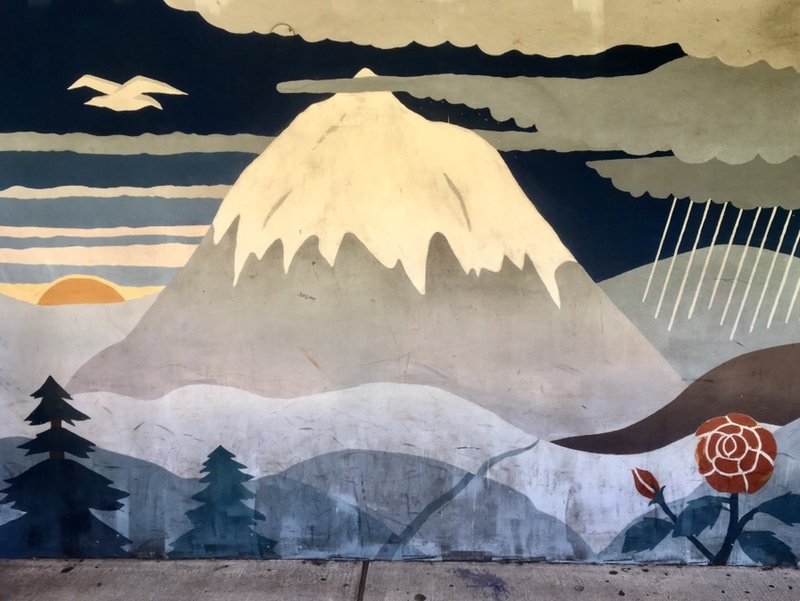 This elementary school mural in SW creates a pleasing picture of the snow-covered peak with cloud cover below and an errant sea-gull. It makes an effort to show all of Oregon weather conditions that are capable of happening at the same time. 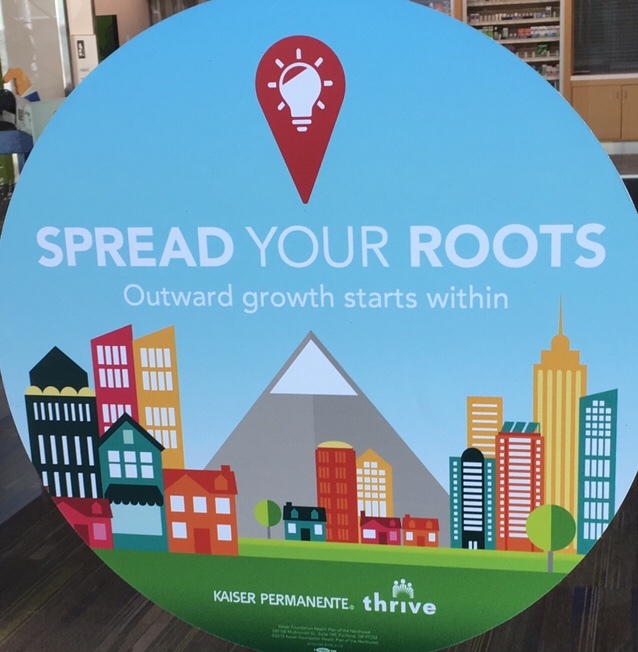 Sure I bought into pyramid power back in the ’70’s, we all did, but this portrayal of “Hoodie” seen at the Interstate Kaiser Medical Office is too angular, too geometric as well as being too pyramid-shaped to depict our mountain friend in a just manner. This is a great take on Mt. Hood using expressive, autumnal colors while including lifelike, glacial features of the area. The multicolored birds flying off the side of the building are an added bonus. Sure we all know all about the Pacific Crest Trail so the use of Mt. Hood for this business name makes sense. 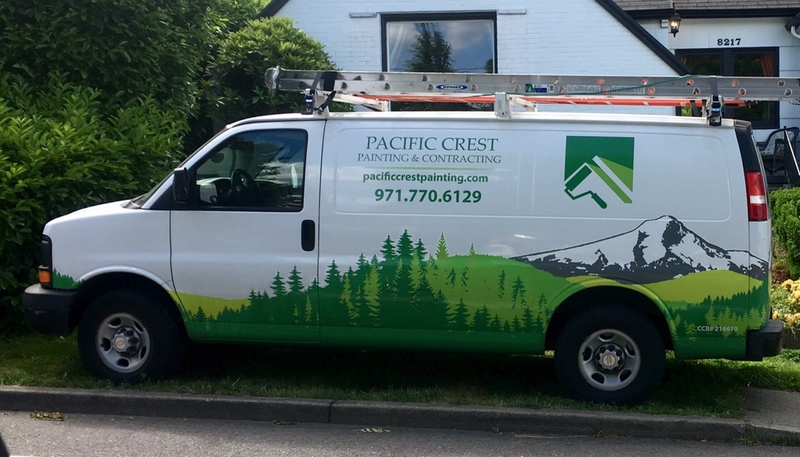 It’s so nicely done that I’m tempted to call them just so I can gaze at their van while they work on the house. Nice pastoral meadows dwarf the mountain a bit but this scenery is the next best thing to being there. 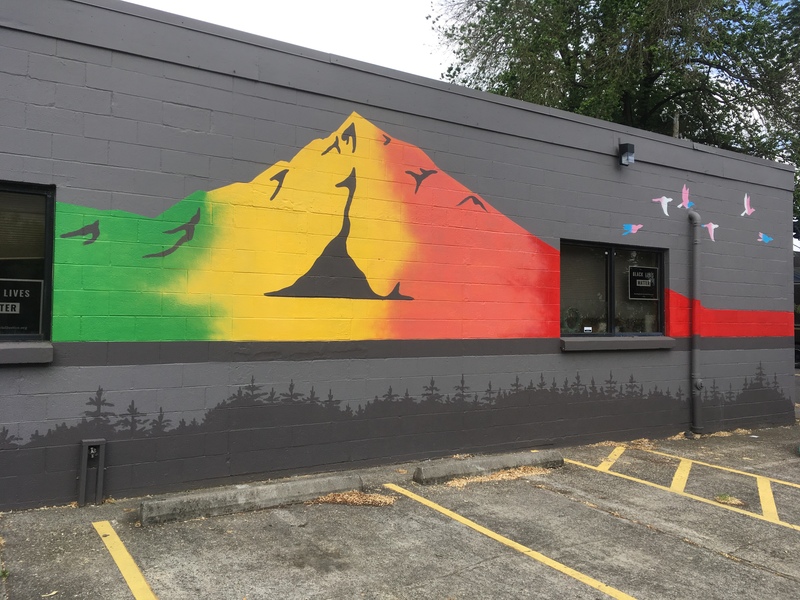 Spotted and photographed from the window of the New Seasons across the street, it dawned on me that the Best Buds cannabis shop on Lombard Ave has offered up a Mt. Hood mural on the side of their building. This is quite the tribute to the views of the mountain that you sometimes get driving down Lombard. 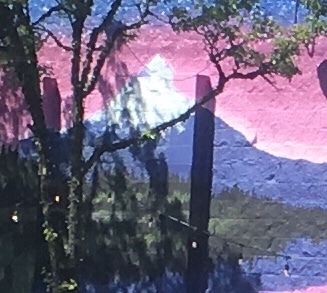 Detail, Purple and white Mt. Hood. 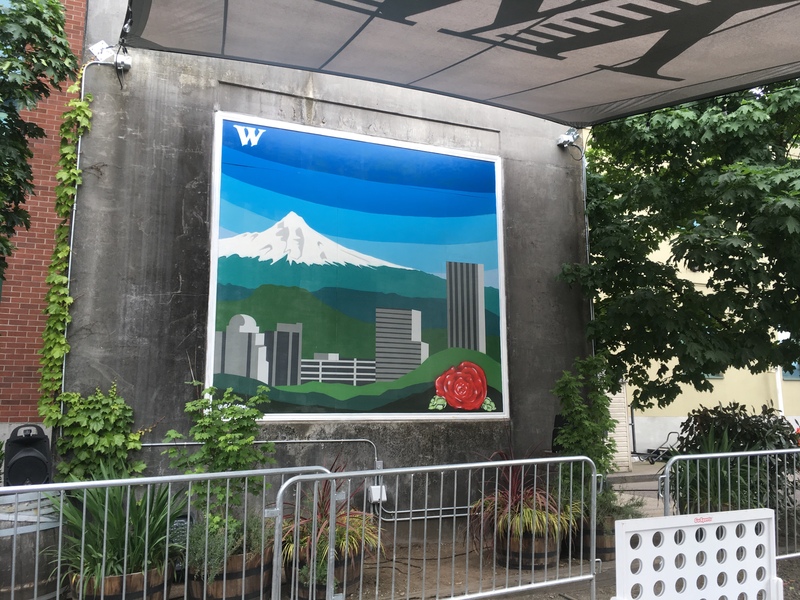 In the beer garden at the Widmer Brewery, a mural of Mt. Hood caught my eye. I wondered if it was advertising a new Mt. Hood beer. 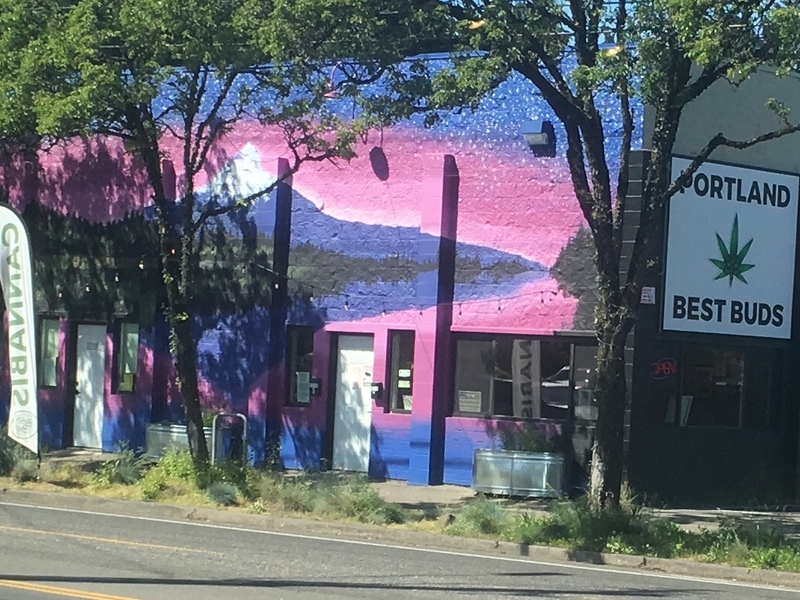 On closer inspection it was a gallant piece of art with only an almost subliminal W in the top corner connecting it to the brewery. 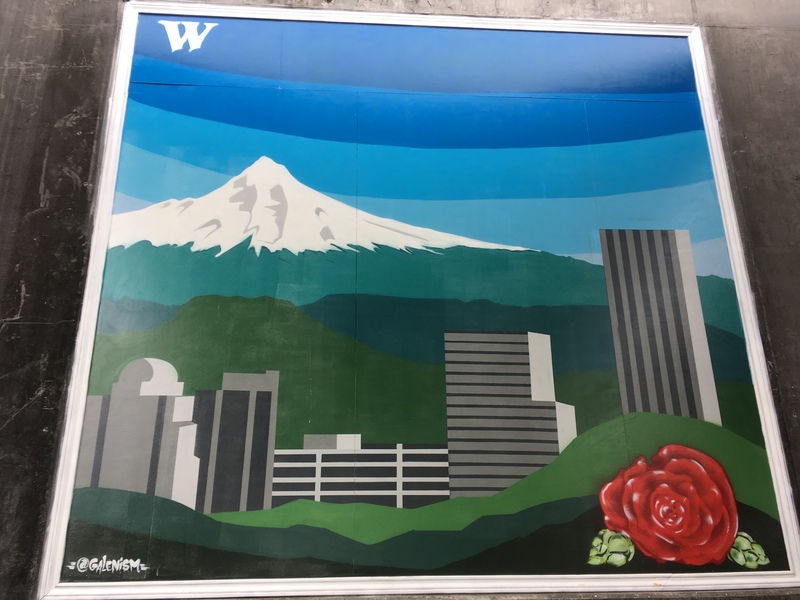 Ah, the mountain, the city, the rose, the painting lacks flowing beer which would tie this piece together. 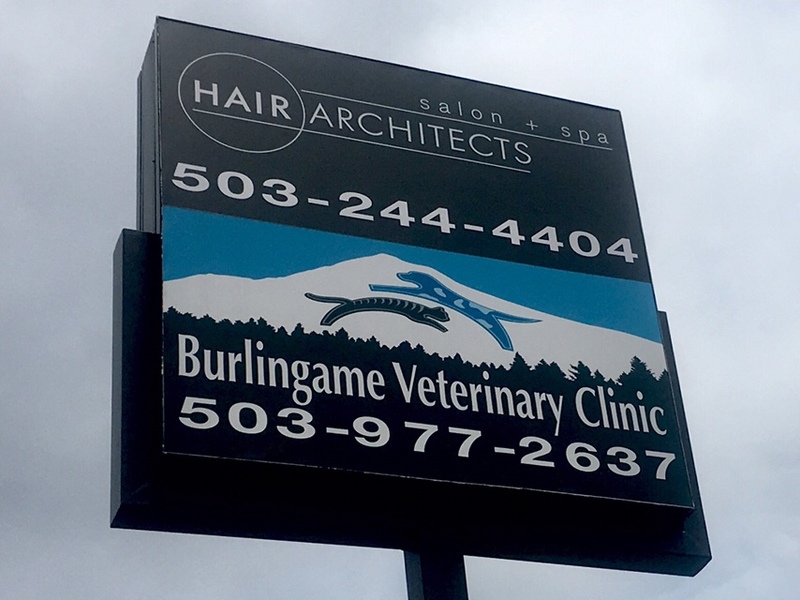 The mountain appears simply and majestically on this sign. The addition of a frolicking cat and dog are a great way bring attention to the business. It makes sense that if a healthy cat and dog visited Mt. Hood they would leap over one another with great gusto and expressions of joy. Maybe not the best slogan but far be it from me to think I could come up with something better. This is a nice use of Mt. Hood. It seems to hug the city, surrounding it and offering a nice caress. Mt. Hood and Portland get along as well as any natural landmark and city could be expected to. 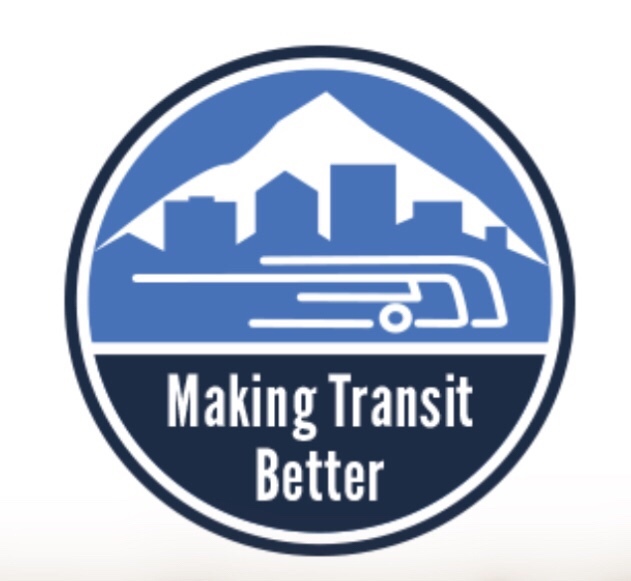 What this all has to do with making transit better I don’t know. It might be that we should all be enjoying our Mt. Hood view as we travel by Max train over the river.